Announced last March, the Skylife SampleRobot Volca-X special edition for the Korg Volca Sample is now available with an early bird offer. New Sonic Arts announces the release of a new version of its Nuance sample player along with a special offer available in May. Logelloop, a French multitrack looper software for Mac OS X has recently been updated to v4.2, with many new features. IK Multimedia has released version 3.5 of SampleTank, an update that opens the doors of a new Custom Shop with 11 sound expansions. Skylife will release in March a special edition of its SampleRobot software for the Korg Volca Sample sequencer. 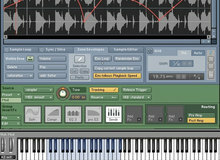 Sync is intended for electronic musicians seeking construction kits for Kontakt, but also for other sample players. Steinberg celebrates Valentine’s day with a special offer on a selection of VSTis until Sunday. In the holiday spirit, UVI have just released a free vintage video game for their UVI Workstation.